The pulse transformer is a basically a transformer which couples a source of pulses of electrical energy to the load with its shape and other properties maintained. The pulses may be respective or non-respective. These transformers are used in digital circuits. Pulse transformers are small in size and have comparatively few turns. Hence the leakage inductance of the windings is minimum. These transformers have low interwinding capacitance. The cores are constructed of ferrites or wound strips of high permeability alloys such as permalloy. Due to this, pulse transformers have high magnetizing inductance. The transformers have high-voltage insulation between windings and to ground. The signal handled by the pulse transformers is usually a pulse or train of pulse and not a sinusoidal signals as in the case of conventional transformers. The rectangular input pulses to such transformers is shown in the Fig. 1. The performance of the impulse transformers is specified in terms of its effect on the shape of the pulse input current or voltage. Small pulse transformers used in computers, pulse generator etc. can deliver only a few volts at pulse duration of a few hundred nanoseconds. Large pulse transformers used in radar systems etc. can deliver power in the range of 50-100 MW at 200-300 kV with pulse duration of a few microseconds. It is important that the transformer reproduce the input pulse as accurately as possible, at its secondary terminals. 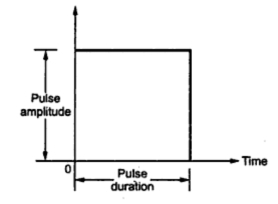 there should be minimum shape distortion while transferring the pulse from the pulse generating circuit to the load. The ideal input rectangular pulse can not be obtained in practice. This is because dI/dt can not be infinite. The practical pulse input signal is shown in the Fig. 2. The pulse width varied from fraction of microsecond to about 25 μsec, as mentioned earlier. The effect of pulse transformer while transferring such a pulse to the secondary or load is analysed by solving the differential equivalent circuit of a transformer including stray capacitance. Due to the stray capacitance, the output response is generally of the type of demand oscillations. The rise time of such output response sets the limit on the maximum pulse repetition rate, which can be handled by the pulse transformer. The rise time adds an error distorting the output response. Hence rise time should be kept as small as possible. The leakage inductance is kept to a minimum value, to obtain shortest rise time. In the pulse transformers which drives SCR's and switching transistors, a higher rise time can increased their junction temperatures to a limit where the devices can get damaged. Apart from the overshoot, there is a back swing present in the response, which is the portion of the response which extends below zero amplitude, after the pulse width. This part of the response is called trailing edge response. The response, till it settles down after the overshoot is called leading edge response. While the response in between trailing edge and the leading edge is generally flat called top response. iii) Trailing edge response giving fall time characteristics. 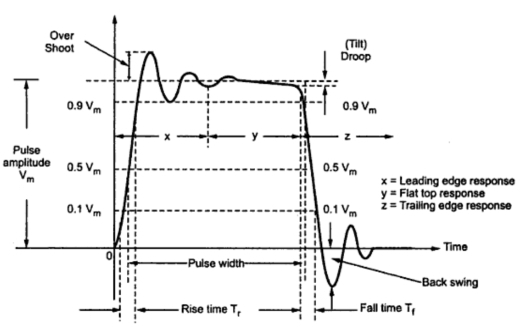 The overall voltage (or current) pulse shape of pulse transformer output is shown in the Fig. 3. In addition to the input-output impedances, turns ratio, pulse duration and repetitions rates etc, the pulse transformer specifications include the various parameters related to output response shown in the Fig. 3. It is the maximum absolute peak value of the pulse excluding the unwanted spikes. It is time taken by the output pulse to rise from 10% of peak pulse amplitude to 90% of peak pulse amplitude, during its first attempt. Sometimes it may be defined as the time taken by the output pulse response to rise from 0 to pulse amplitude, for the first time. The amount by which the output pulse exceeds its peak amplitude is called overshoot. The time interval between the first and last instants art which the instantaneous amplitude reaches 50% of the peak amplitude. This is also called pulse duration. It is the displacement of the pulse amplitude during its flat response. It is also called tilt. It is the time taken by the output pulse to decrease from 90% of its peak amplitude to 10% of its peak amplitude, during trailing edge response. It is also called decay time. The portion of the trailing edge which extends below the zero amplitude level, is called back swing. The pulse transformers are commonly used in pulse generating circuits, SCR and switching transistors, control circuit for controlling the firing, radar systems cathode ray tube circuits, microwave tube circuits, data handling circuits, analog switching applications etc. The transmission line pulse transformers are useful in fast pulse signal transmission applications etc. The transmission line pulse transformers are useful in fast pulse signal transmission applications. They are also used in digital signal transmission.